We specialize in producing floor trusses for all project sizes. Currently, we produce floor trusses up to 30' long and up to 28" deep. Our floor trusses are more cost effective for most projects than other engineered joist. Each truss is custom designed to fit your project. The floor trusses are open web which provides space for plumbing, electrical, and duct work. No cutting is needed. 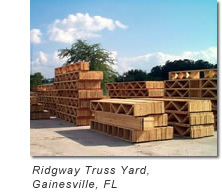 You will save on bracing and installation time with a 3 1/2" wide open web floor truss from Ridgway.